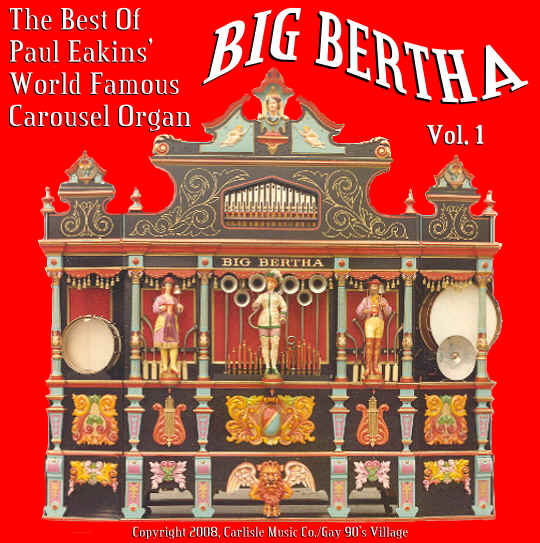 The "Big Bertha" Carousel Fair Organ captures the adulation of audiences everywhere she was exhibited. One of three organs that were on a beautiful old Looff Carousel in Ramona Park, Grand Rapids, Michigan, from 1910 to 1955. She was put in storage until moved to Gulf Shores, Alabama. Big Bertha is a Limonaire Organ having been made in France in the late 1800's. She was purchased by Paul Eakins in 1963, and over 2500 man-hours were spent in completely redoing the organ from August 1963 to June 1966. During 1978, the fifth change in the method of programming was made for Big Bertha. Big Bertha was showcased at the Gay 90's Village in Sikeston, Missouri, and the Gay 90's Melody Museum in St. Louis, Missouri. The organ also traveled the country to various State Fairs and Expositions up until Paul Eakins retired in 1978. He then sold Big Bertha and most of his collection to Disney World in Orlando, Florida. The director holds the baton with her right hand, and when she turns her head to the left, directs in time with the bass drum; when she looks straight ahead again, she raises her left hand. She is flanked on either side by a bell-ringer. The three figures are beautifully proportioned and resemble real people. Hand carved, the embellishments are colorful and elaborate. On the top grille is an unusual figure-head resembling Columbus. Two charming cherubs with carved gossamer drapings also adorn the grille. At the lower center of the facade is a very savage-looking gargoyle. These are all fine examples of the highly specialized art of wood-carving. Big Bertha is truly a work of art and her music is very exhilarating, bringing back the nostalgia of bygone days. Sit back and enjoy Big Bertha at her best.